If you are looking to buy, sell, or spend Ethereum (ETH), you should first check if Ethereum is legal in your country. Different countries hold different stances on cryptocurrency and their regulations. While some countries' laws single out Bitcoin, it is still rare to find a jurisdiction which created a different set of rules concerning the Ethereum network and its native fuel ether (ETH). In most cases, it just falls under general cryptocurrencies rules. In some countries, even the mere possession of cryptos can get you to prison, while many of them have not even bothered to regulate it, leaving Ethereum and other cryptos in legal limbo. Although Ether and cryptocurrencies are welcomed in many parts of the world, several countries have prohibited their trade or use due to their decentralized nature, perceived threat to current monetary systems, volatility, or alleged use to facilitate illegal activities. In addition to the countries where ETH is banned, there are more countries in which Ethereum is restricted and cannot be used for payment. In such states, banks and other financial service providers are prohibited from dealing with cryptocurrency exchanges. In more extreme cases, such as China’s, the country has banned crypto exchanges altogether. It’s important to note that despite the bans and restrictions, strict laws have not eradicated Bitcoin, Ether, or other cryptocurrencies, their trades or their usage because it is nearly impossible to ban them. Besides, people can still make use of sites like Local Bitcoins to trade cryptocurrencies using cash and other methods. No government has the power of truly banning decentralized cryptocurrencies unless they prohibit the usage of the internet. 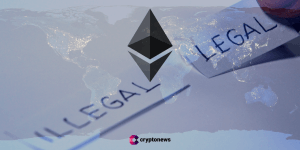 On a positive note, there are at least 111 states where Ethereum and other cryptocurrencies are recognized under the law and have a certain legal status. For instance, the United States and Canada hold a generally crypto-friendly attitude towards cryptocurrencies while also trying to enforce anti-money laundering policies. According to the European Union laws, the member states cannot launch their currency, but crypto exchanges can be legalized, depending on the individual countries’ regulations. Fears of widespread cryptocurrency crackdowns have had a long-standing effect on the fledgling crypto industry. Despite that, a growing number of countries and governments opt-in to embrace digital innovation and play an important role in the industry’s future. At the same time jurisdictions that oppose the change are at risk of finding themselves at an overwhelming economic disadvantage. These are already some of the poorest countries in the world, and cryptocurrency business presents an excellent opportunity to bring in innovation, capital, more tax revenue and better living standard for the whole population.